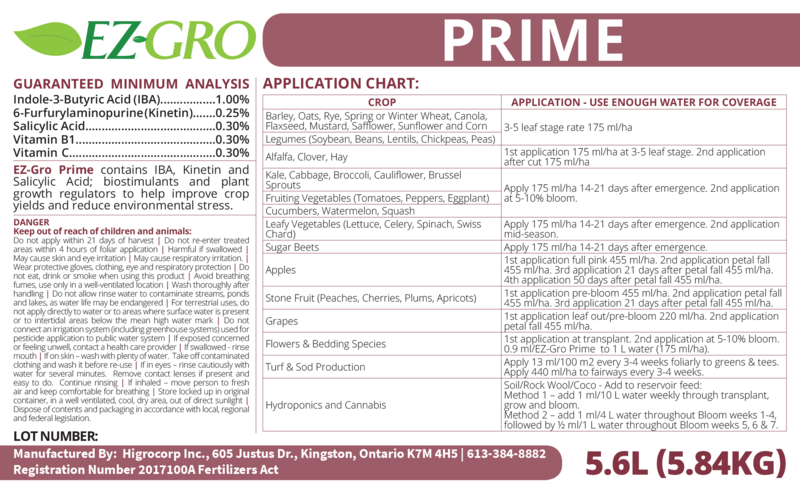 EZ-Gro Prime is a CFIA registered plant biostimulant containing potent growth regulators and stimulants such as IBA, Kinetin, Salicylic Acid, Vitamins B1 and C. Indole-3-butyric acid (IBA) is a growth-promoting phytohormone known as an auxin. Kinetin, a cytokinin, stimulates cell proliferation and differentiation. Salicylic Acid improves resistance to drought and environmental stress, enhances hardiness, flowering and fruit yield. Together these compounds stimulate root formation and improve rooting percentage, increase crop yield, and improve fruit and grain size and quality. Apply EZ-Gro Prime to significantly enhance your crops roots and even reduce transplant shock. • IBA is an endogenous plant hormone that gets converted to IAA to promote the development of adventitious roots. • Kinetin and other cytokinins have been proven to positively regulate traits like grain or fruit size and biomass. • Salicylic acid is an endogenous signaling molecule associated with various defense mechanisms and is known to protect against drought and salinity, as well as heavy metal toxicity and extreme heat. • Vitamin B1 has been shown to function as an activator of plant disease resistance traits to improve health and vitality. • Vitamin C has proposed functions in photosynthesis as an enzyme cofactor (including synthesis of ethylene, gibberellins and anthocyanins) and in control of cell growth.